The Army Technical Development Board (ATDB) coordinated military research and development in Canada during the Second World War. Many of their endeavours were reasonably successful, while others should probably never have been started. 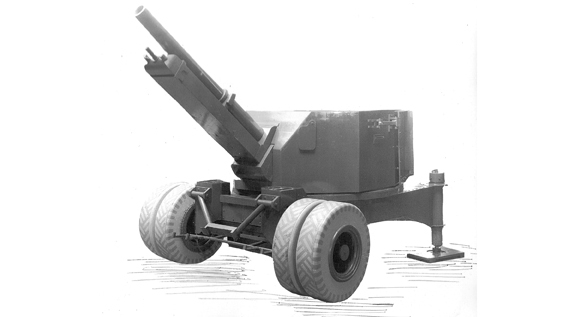 In the “weird projects” category, the ATDB opened a project in September 1943 to develop a “Mobile Armoured Rotating Carriage (MARC)”.The project had been initiated by the Director of Artillery, and the aim was to design a gun carriage that could fulfill the role of both a field gun and an anti-tank gun. The field gun in service at the time was the 25-pounder gun, and this was incorporated in the original discussions. 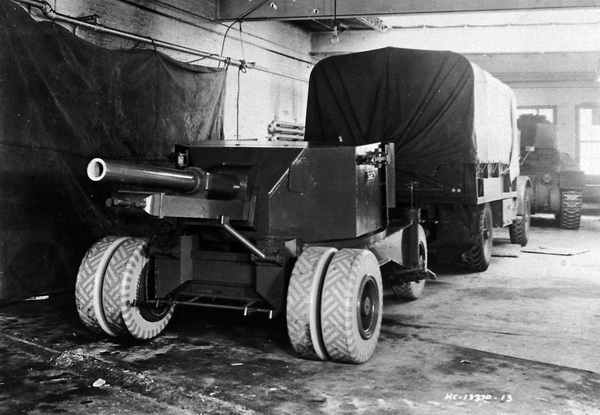 However, in less than a month, the headquarters of the Canadian Army Overseas (CAOS) stated that they had no requirement for this type of gun carriage, and the project was considered cancelled in October 1943. No work had been undertaken. 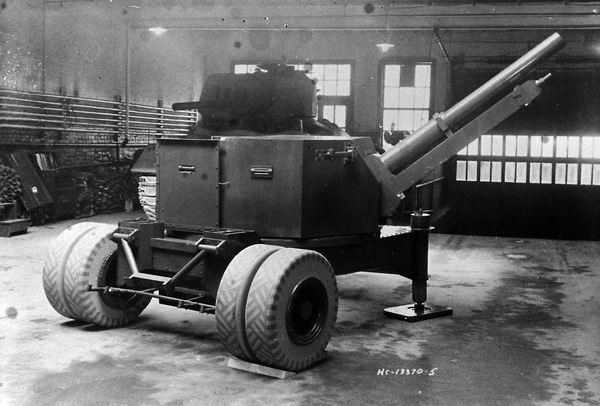 In December 1943, the project was revived based on a new requirement for a combined anti-tank / anti-aircraft gun. CAOS requested that the carriage be evaluated in conjunction with the high-velocity 6-pounder gun that was being developed by another ATDB project. CAOS insisted that the carriage had to be capable of -5º depression to +80º elevation. It had to have 360º traverse and be covered by a bulletproof shield. Three gunners had to work inside the shield, and they had to have immediate access to twelve rounds of ammunition. The weight of the whole carriage should not exceed 7,500 lb (3,400 kg). 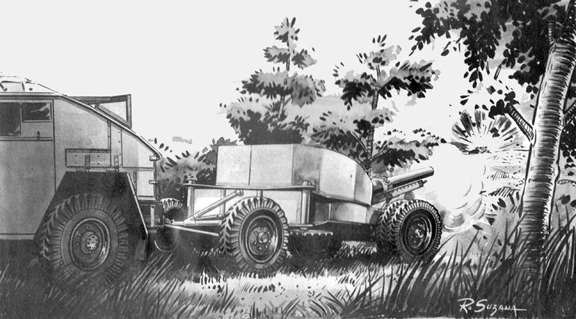 By February 1944, the contractors, Specialty Equipment and Machinery Company of New York, and Ward LaFrance Truck Division of Elmira, New York, had carried out the necessary stress calculations, and had prepared assembly drawings of the MARC. In March, the contractors offered to build a pilot model at their own expense, using the standard 6-pounder 7-cwt anti-tank gun that was then in service. 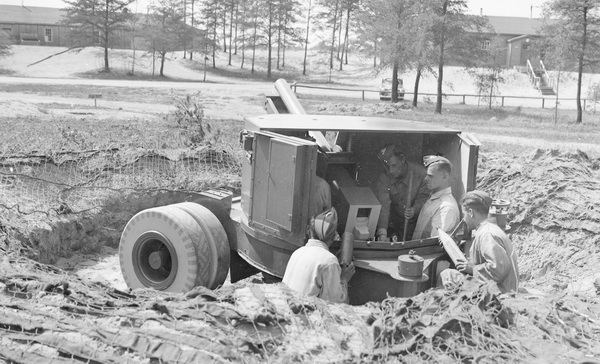 A wooden mockup was constructed and demonstrated during the late springat Camp Petawawa, Ontario, in an attempt to determine the feasibility of the concept. No actual development took place, and there were some contractual problems with the two companies involved. By the summer, it had been established that there was no service requirement for an equipment of this nature, and the project was finally cancelled on 11 July 1944. You can rate this article by clicking on the stras below. Initially developed by Jacques Riboud a French engineer who had married a Baltimorean wife.